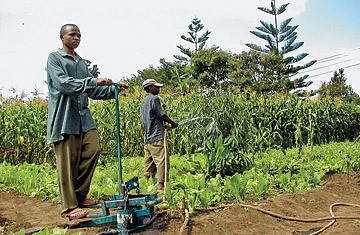 Eighteen years ago, KickStart's founders, former aid workers Martin Fisher and Nick Moon, were branded as heretics for selling irrigation pumps to poor Africans. But experience had shown them that business models work: people are more invested in the success of a tool they buy than in one they are given. So far, the aptly named MoneyMaker pumps have helped 85,000 families increase crop yields and lift themselves out of poverty. Some have even sold their wares to supermarkets in Europe. See pictures of China doing business in Africa.